Howards Grove Middle school students sent five teams to the Lakeland University Math meet this year! This is an annual Mathematics competition held in November, in which our middle school students have the opportunity to showcase their Math talent against area middle school students. Forty-seven teams (about 380 students) competed in the competition. Each team did an outstanding job and represented Howie Middle School well! Some students earned individual medals for their high scores. Individuals that placed at the meet were Pierce Hoewisch and Jayden VanHelden, both 8th graders. Congratulations Pierce and Jayden! 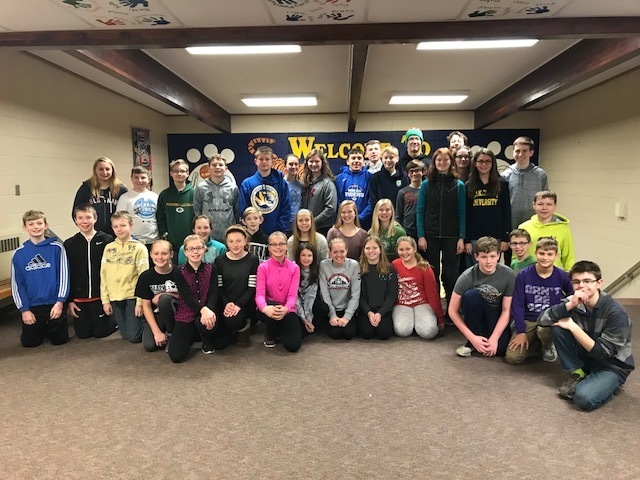 The five teams that competed were Mandy Baldwin, Allison Lang, Josie Larson, Saige Damrow, Ellie Schueler, Ava Priebe, Eden Maranell, and Kamryn Kaminiski. Great job “Girl Power”Team! Ellen Froelich, Amanda Vasconi, Ruby Jump, Mary Athorp, Joselyn Carmody, Hailey Vande Hei, Brooke Kimme, and Meghan Zielinski were another excellent “Girl Power” Team! The team of Connor Grubisic, Pierce Hoewisch, Jayden VanHelden, Luke Matte, Sam Lilyquist, Gary Kalk, Tony Lamansky, and Heath Roethel was strong with high scores! Charlie Marten, Jacob Halverson, Jack Schroeder, Sam Dehne, Ben Stenson, Miles Fetterer, Lily McBroom, and Brody Grunewald represented Howie Middle School well, posting high scores! Kevin Erbrecht, Payton Danen, Colton Wittgreve, Brayden Peter, Trey Sixel, Mikena Grunewald, McKenna Kuhfuss, and Grace Matte was a team of consistency! All members of this team earned very good scores. Thank you to all students that competed this year. You were all very enjoyable to work with, and were filled with so much talent and enthusiasm for learning! Awesome job Howards Grove Middle School students!! We are looking forward to sending more teams next year, so students in 5th ,6th and,7th grade that love math and a little competition, be ready to sign up in the fall. Students in 8th grade: See Mrs. Hill to sign up for the high school competition.